The Art Journal, 'Illustrated Catalogue of the Paris International Exhibition. IV', pub London, 1878, p. 243. Earthenware tiles printed with scenes from the series 'Times of the Day and Months'. Each of these tiles depicts a Classical maiden in sepia on a white ground, titled 'Aurora', 'Autumnus', and' Meridies'. 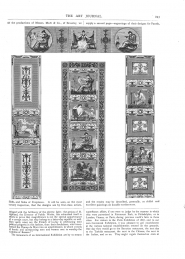 The tiles were designed by the Victorian artist and illustrator, Walter Crane (1845-1915) and a series, including further designs, was exhibited by Maw & Co. in the Paris International Exhibition of 1878. Literature - Hans Van Lemmen 'Decorative Tiles Throughout the Ages', Bracken Books, plate 21 for a reproduction of these tiles in a Maw catalog. An example of the 'Meridies' tile is held in the Ironbridge Gorge Jackfield Tile Museum collection.